Jimmy Page and Perry Ford from Lincoln were also members, although Page didn’t stay in the band very long. 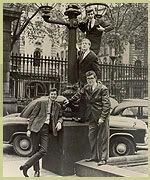 In 1964 the group released a single featuring Jimmy Page on lead guitar, “Skinny Minnie”, a cover of the Bill Haley and the Comets song originally released in 1958. Carter and Lewis were initially songwriters. 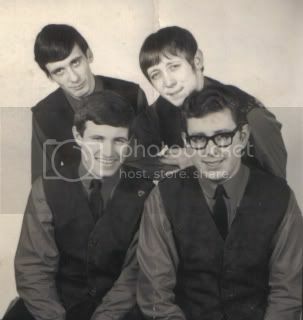 They wrote and performed for the former BBC Light Programme’s shows Easy Beat and Saturday Club. Their manager Terry Kennedy convinced them that they needed to form a band to showcase their songs. Ironically hardly any of their singles featured Carter-Lewis compositions. Rupert Ross quit to join probably the most underrated but one of the most talented outfits in England, namely Carter-Lewis and the Southerners. Based upon the hit song-writing duo of John Carter and Ken Lewis, the group boasted a line-up of Rupert Ross on bass, Viv Prince on drums and Jimmy Page on guitar. Jimmy was shortly to leave and so Rupert drafted in local boy (from the Downbeats) Micky Keane. This was a big period for Rupert, as John and Ken were writing hits for lots of acts, and it was necessary for the Southerners to demo these songs in the London studio at Southern Music. Whilst the Flintstones had cut two singles and half an unreleased album with the legendary Joe Meek, Rupert now found himself playing the part of a session man.